Why is Topps doing this to me? Don't they realize that the last thing a Dodger fan wants to be reminded of is Andruw Jones? Featured above is one of the first cards found on eBay from a new Topps product called 2015 Topps Archives Signature. 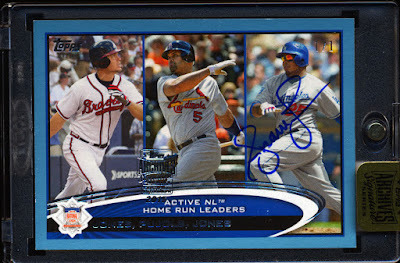 It is a 2012 Topps buyback card of the NL Active Home Run Leaders and it has been signed by Andruw Jones in a Dodger uniform. Ugh! As you may recall, Jones came to the team with much fanfare. He was coming off one of the worst seasons in his career; having hit just .222 as a Brave. Still, he got on base at a healthy clip, hit for power and was young enough to get past his recent struggles. So the two-year $36.2 million deal seemed like a great gamble. Unfortunately, it turned out to be a contract we all came to hate. Andruw Jones slashed a pathetic .158/.256/.249/.505, and smiled all the way to the bank. By the next season he was sent packing to the Rangers with the Dodgers paying $21.4 million of his remaining contract. As for the card above it is a "1 of 1" signed card, so you won't be seeing it in another box (thankfully). On top of that, I still find it strange that Topps chose to use a photo of Jones in Dodger Blue when he hadn't been with the team for almost four years by the time of its original release. Wouldn't a pic with him as a Brave be more appropriate for that card? Anyway, the product will cost you about $50 a box, and you get one encased buyback card that has been signed by a retired player on-card. 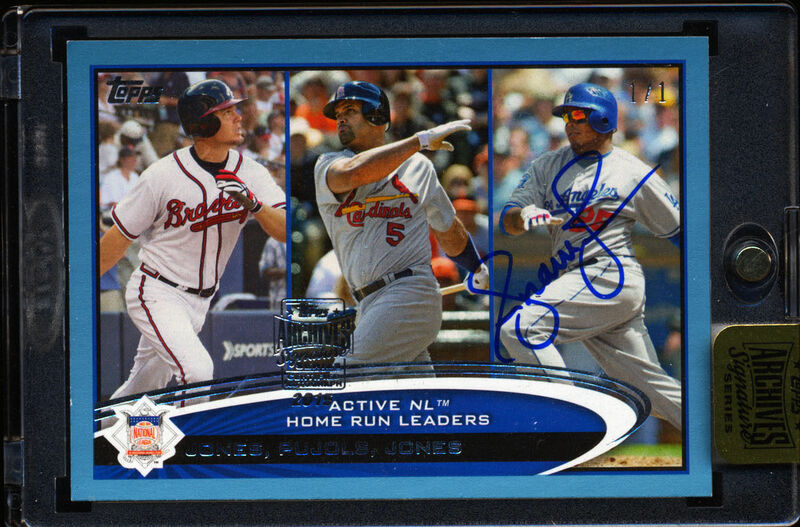 It is very similar to the 2004 Topps Originals Signature product (one of my favorites). Go here for a player checklist. Other possible Dodgers' found within include Shawn Green, Sandy Koufax, Mike Piazza. I'll do my best to checklist all of the Dodger cards available, but I suspect I'll miss a few here or there.